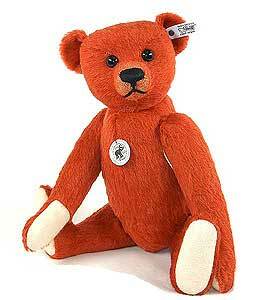 Our Steiff Replica 1912-1913 Teddy Bear is made from the finest red mohair. This rare replica wears the famous Steiff trademark, Button in the Ear replicated from the year 1912 which was an underscored patinated steel. When an avid and knowledgeable British collector viewed a regional auction he knew instantly that the bear in front of him was not as described in the catalogue. The bear was a Steiff of red mohair and of outstanding character but what was his real provenance? Trusting his instincts he secured the bear named "Ed" and then contacted Steiff. It was quickly organized for "Ed" to meet the experts at both Steiff and Schulte and only after a final visit to the Steiff Archives was it confirmed "Ed" was previously an unknown bear. Believed to be a prototype and only the second red bear ever made by Steiff (after Alfonzo in 1908) "Ed" has been dated circa 1913. Originally made from a bright red short pile, "Ed" is indeed an outstanding bear. Our Replica 1913 bear is certain to captivate you just as "Ed" captivated his owner.